Search for “PortableDeviceNameSpace”. This should be contained in the Vid_####&Pid_####\########_-_########_-_########_-_########\Device Parameters within the above …\USB\ The ##’s listed here will be numbers and letters specific to your Zune. 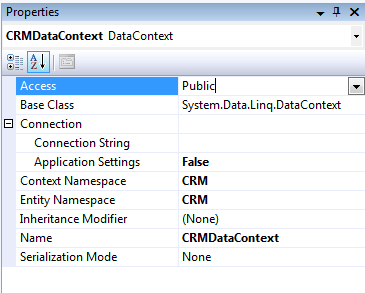 By default the DBML object sets the connection string information on the properties tab of the designer (available when you click on the white space in the the ORM designer). IMPORTANT NOTE: Although you can select a web.config entry from the drop-down list in the designer, it will actually store the detailed connection string information in the DBML.cs file and not actually re-read the web.config at run time. To use a true dynamic web.config default (vs. this hard coded default) make sure the designer connection is blank as shown in screen shot below. 3) Copy the .DLL to a folder on the target machine. 4) On the target machine run "Assembly" (from the windows run). 5) Drag the .DLL onto the Assembly window. You can also translate colors without the ColorTranslator class (which may be useful if you are using the Compact Framework). System.Drawing.Color only supports creating custom colors using it's FromArgb method, which requires base-10 inputs. Therefore, two conversion functions are needed - a conversion from decimal to hexadecimal, and a conversion from a 6 character string to three numeric parts (one each for red, green, and blue). Source CodeThe first function handles the safe conversion of a hexadecimal (base-16) number to decimal (base-10). The next function breaks the hexadecimal string into parts, removes a leading # (so you can pass it #FF00FF or FF00FF with the same result), and then converts the hexadecimal parts into decimal, and creates a color using the red, green, and blue value integers. 1) Enable via Project Properties (on the Build tab). 2) Build project and you will receive warnings about all Public members that are not documented (you can double-click to add appropriate documentation in each section). 5) Once you click on build the tool will generate HxS file under the sandcastle installation directory (named whatever you selected in the "Name" field). We will use this file to create a setup.exe which when installed integrates it with Visual Studio. 6) Open Visual Studio 2008 and click File -> New Project : In the new project dialog expand "Other Project Types" and select Extensibility. On the right hand side select "Help Integration Wizard" and enter a name for the project and click OK. In the wizard that appears select "Setup project" and click Next. 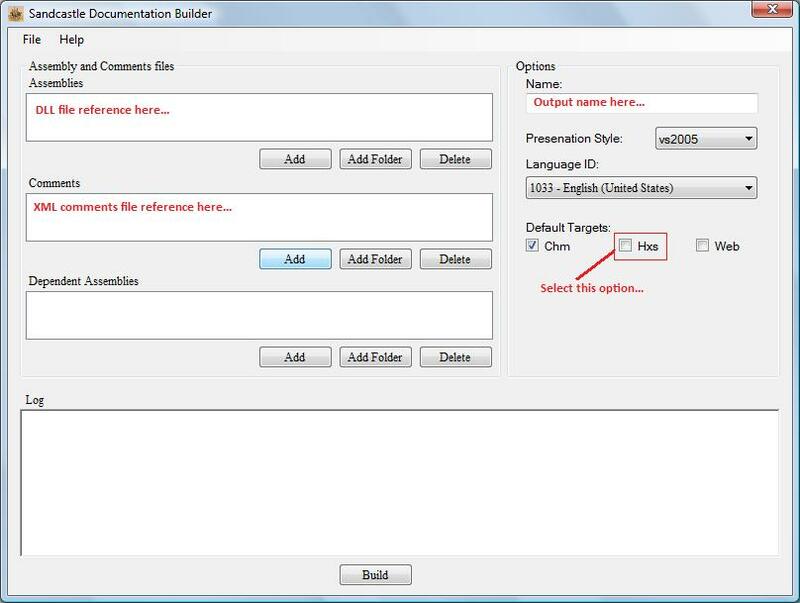 In the next step select the HxS file we created in Step 5 above. Visual Studio now creates 2 projects a Merge Module project and a setup project. Click on the setup project and modify its properties as needed. 7) Now compile the setup project to generate an MSI and a setup.exe file which when installed integrates the help with VS.NET. You might have to close and re-open all instances VS.NET to see the change. Now type in a class name in the code editor and press F1. VS.NET should directly take you to the documentation associated with that class. Below are the basic XML documetation tags you can apply to the source code for building the help file. A short description of the item; describe the members of the type here. The "Remarks" section of the documentation; specify overview information here. The "Example" section of the documentation. A link in the "See Also" section of the documentation. Describes a parameter to a method. The return value of a method. The exceptions that can be thrown. Describes the value of a property. The permission applied to a member. Format characters as code within other text. A link to a type, member or field in the current compilation environment. Undocumented. A link to a keyword in the language of the current compilation environment, e.g. null. A reference to a parameter within other text. A paragraph within other text. Refer to comments in another file.